Chiharu, Kayura, Hina, and Ayumu encounter a strange woman who tells them that the Life Restaurant disappeared, thanks to always being in the red. When they ask about someone with a scar that used to work there, she points them to an employment agency. The woman disappears, leaving the girls annoyed by it all. Returning to the hotel, the girls inform Hayate, Nagi, and Maria about what happened. Ayumu decides that they should go to the beach and have some fun, so thought Nagi is skeptical, she goes along with this plan. In the water, Nagi steps on a small octopus, which scurries off as Ayumu mentions how cute and rare they are. At a seaside café, Kayura and Chiharu marvel at how much of the menu has octopus on it. Chiharu takes the opportunity to ask Hina how she’s going to seduce Hayate, causing Hina to panic and deny being interested in Hayate. 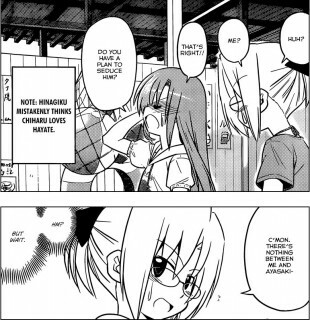 Hina tries to turn the tables on Chiharu since Hina thinks that Chiharu also loves Hayate. Chiharu says there’s nothing between herself and Hayate, but then thinks on how her involvement could spur Hina into action. So, Chiharu takes off her over shirt, telling Hina she’ll give seducing Hayate a try, and heads out to find him in her bikini, leaving Hina in a state. On a rocky part of the shore, Hayate wonders if Ikusa was actually at this beach when he sees a small octopus in the water and picks it up. 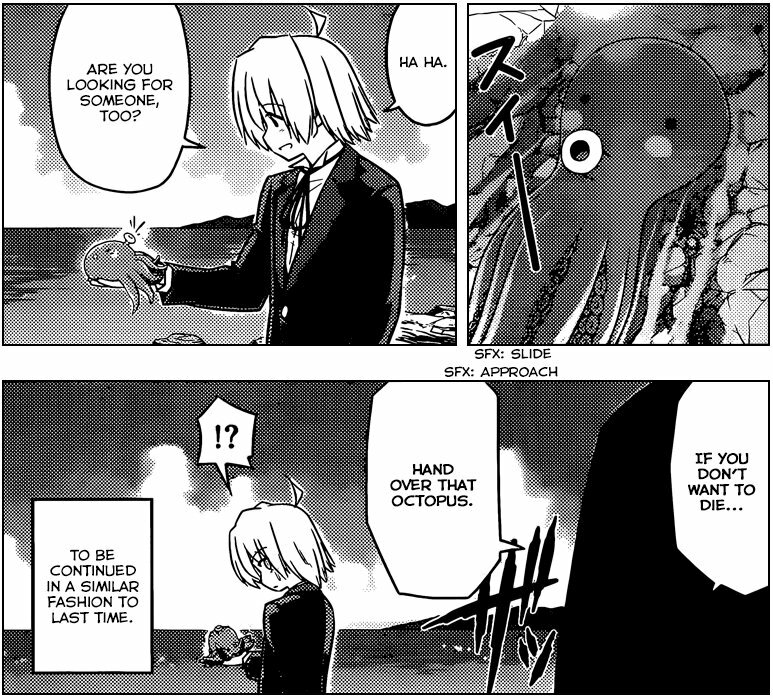 Someone comes up behind Hayate, telling him to hand over the octopus if he doesn’t want to die. I was amused in the previous chapter that the girls of Yukari-chan House go to the beach and aren’t in swimwear. After all, I think fans of Hayate the Combat Butler were expecting that chapter to be full of fanservice. So after a one chapter delay, plus a week delay due to the manga not being published last week, fans get the service, though none in the color pages. I loved how Chiharu decided to troll Hina by indicating that she was going to go after Hayate. Somehow, I expect Chiharu, who’s always been friendly with Hayate but thus far has not fallen for him, may actually decide to give Hayate a go. Speaking of trolling, Hata-sensei trolled us a bit with this mysterious girl that showed up. Whether she plays a further role or not remains to be seen. So, who’s the new person who shows up at the end of this chapter? It could be Ikusa, but it could be another troll maneuver as Hata-sensei enjoys doing that. 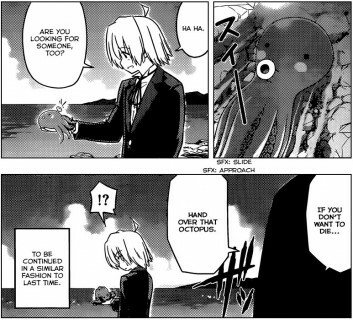 The octopi in this chapter reminded me of Urusei Yatsura, enough so that the mystery person in my mind became Shuutaro, a character from UY who’s family mascot is the octopus and who raises and cares for octopi quite a lot. The seaside cafe kinda reminded me of the cafe that Ryuunosuke and her idiot father always talked about opening. I don’t know that Urusei Yatsura was being given a nod here or not, but that’s what I thought about. So, not much here to push the story forward, but some fun was had, some fanservice, and some table setting. I’m looking forward to the next chapter. Not sure about Urusei Yatsura, but I definitely saw the Ikamusume characters somewhere on page 13, I think. I’m betting on the “troll maneuver” myself. 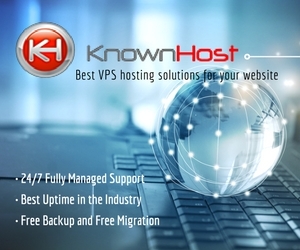 Just keep blogging and letting our voices be heard? Also, if that new project announced in this chapter turns out to be a new anime as someone I stalk in various anime forums has predicted, it might help spike some interest back into this great series… I hope. The last two anime didn’t seem to help much (quite the opposite for some fans who religiously watch out for Japanese sales numbers instead of using their own judgment… it’s frustrating and kinda reminds me of the Vita vs 3DS scenario since both are great systems, but some people are just blind to everything except popular opinion.) It’s too bad that some people will only give a series like this one a try if it’s popular enough. Also, if that new project announced in this chapter turns out to be a new anime as someone I stalk in various anime forums has predicted, it might help spike some interest back into this great series… I hope. You’re not the only one. It was really easy to miss. 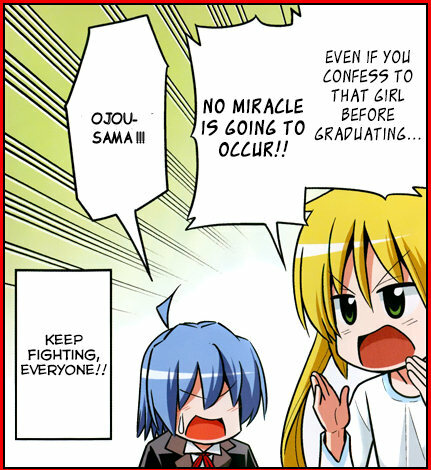 We don’t know what it is yet, of course, but the last several times Sunday has announced a “project” for Hayate it’s been an anime so that seems like the obvious guess. All the more so because they’re bundling the announcement with the next volume, which they’ve again done a couple times now since it lets them put “exclusive preview images” into the special edition and get a sales bump. Only a month away though, not much point worrying about it when it’s such a short wait. Hey, Can’t Take My Eyes of You had some neat bits with Nagi’s parents and the finale was great. Cuties is the season that was all fluff. I have no idea what they’re going to try for, though. The Mykonos arc is great, but it means ditching all the newer characters and moving the storyline way back. The mangaka arc is just finished but would feel too similar to Cuties I think, I don’t think they’d go for it. I don’t think they have enough side chapters to do another season like Cuties even, so man who knows. At least if it’s another original story it will be a surprise, I guess. I liked CTMEOY on the whole, despite not caring for the character designs that much. I liked knowing about Nagi’s parents, especially her father. And bringing in the Kuro-tsubaki sword was nice since it had been name-dropped by Ah-tan during the flashback arc in the manga. If Hata-sensei is going to be involved in developing the plot, then he won’t be devoting time to the manga plot is what I was thinking of in my earlier remarks. Don’t get me wrong, an original story done by Hata-sensei would probably be best, and that may be how things go so that he can tell other canon side stories without having to take time to have them in the manga. I just don’t want to see the manga suffer too much in terms of plot.